Facebook’s stats page indicate that they’ve 250mm uniques users, with 120mm unique visitors per day. I rarely believe numbers provided by vendors as they can easily be stretched so it’s important to compare third party data sources. Looking at just one source is never enough, but comparing trend lines across 3 multiple data sources really gives a greater view. The specific numbers themselves aren’t as important as the overall trend that all three are indicating: Facebook continues to grow in unique visitors from three separate data methods. 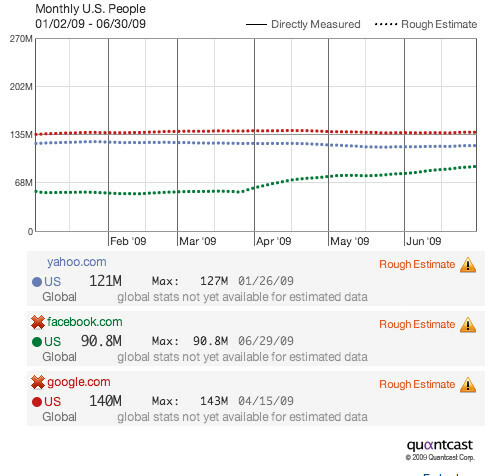 Two of the data sources indicate Yahoo.com is slipping. So what’s it mean? 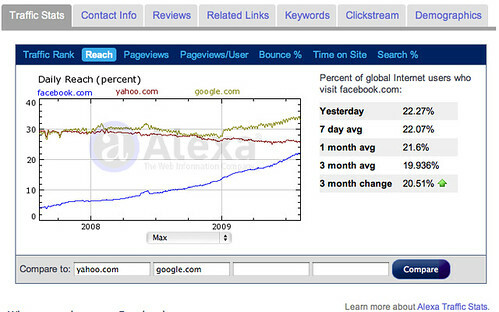 Not a lot really, while Google a search portal, Yahoo, now a media and applications site, really are different than Facebook, a communication and social site. While Facebook may be receiving more unique visitors over time, their business model hasn’t lined up to profit from direct page views as advertising performance is sub-standard. Unique visitors, while certainly an indicator of mainstream adoption –arn’t an fool proof way to measure revenues of any website.